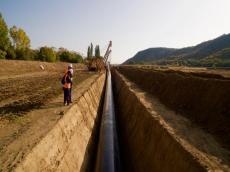 Around 89 percent of the Trans Adriatic Pipeline (TAP) route has been reinstated in Greece and Albania, Trend reports citing a message from TAP AG consortium. “TAP is reinstating around 89 percent of route in Greece and Albania (685 kilometers out of 765 kilometers in total),” said the consortium. Land parcels are returned to owners and users to resume agriculture activities, reads the message.